English communal worker; born in London Sept., 1799; died there March 15, 1882. 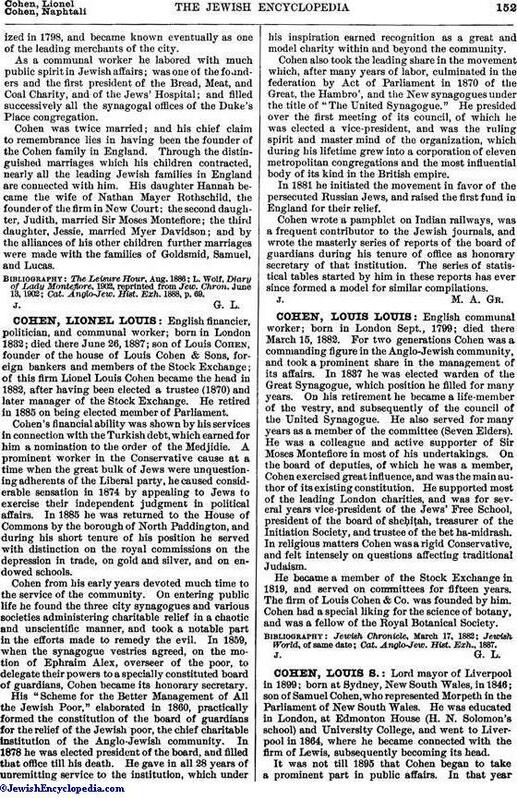 For two generations Cohen was a commanding figure in the Anglo-Jewish community, and took a prominent share in the management of its affairs. In 1837 he was elected warden of the Great Synagogue, which position he filled for many years. On his retirement he became a life-member of the vestry, and subsequently of the council of the United Synagogue. He also served for many years as a member of the committee (Seven Elders). He was a colleague and active supporter of Sir Moses Montefiore in most of his undertakings. On the board of deputies, of which he was a member, Cohen exercised great influence, and was the main author of its existing constitution. He supported most of the leading London charities, and was for several years vice-president of the Jews' Free School, president of the board of sheḥiṭah, treasurer of the Initiation Society, and trustee of the bet ha-midrash. In religious matters Cohen was a rigid Conservative, and felt intensely on questions affecting traditional Judaism. He became a member of the Stock Exchange in 1819, and served on committees for fifteen years. The firm of Louis Cohen & Co. was founded by him. Cohen had a special liking for the science of botany, and was a fellow of the Royal Botanical Society. Cat. Anglo-Jew. Hist. Exh., 1887.